Posted on November 27, 2018 at 11:37 am. Safe Harbors of the Hudson is a mixed-use, non-profit housing and arts redevelopment project in Newburgh, New York. What began in 2002 with the purchase of a deteriorating hotel is now the Cornerstone Residence, a home for 128 residents, including the formerly homeless, those living with mental illnesses and physical disabilities, veterans, low-income working adults, and artists requiring affordable live-work space. With onsite support services, job training, a fitness center, an art gallery, a community theatre, and more, this thriving community is a success story for similar projects. In fact, it has won numerous awards, including the 2007 Residence of the Year Award from the Supportive Housing Network of New York State. 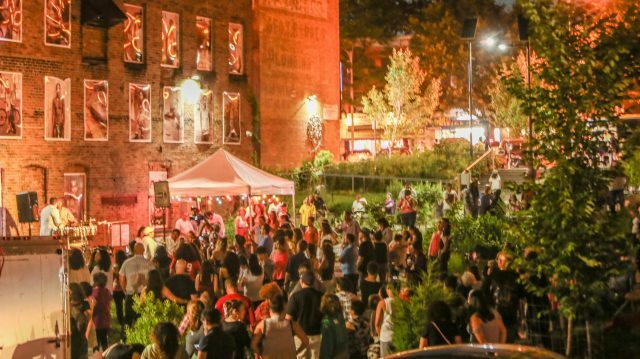 Salsa Night at Safe Harbors Green in Newburgh, New York, is illuminated in part by Sol GreenWay solar lights. “We had some lighting installed on the side of our adjacent building, but those lights were very bright and intrusive,” says Lisa Silverstone, Executive Director of Safe Harbors of the Hudson. Finding a different type of lighting was preferable. One Nature, LLC, the landscape designer and project manager, highly recommended Sol’s solar lighting systems, which would provide directional light, focused on the ground. The solar-powered solution would not require intrusive trenching or other costly disruptions to the landscape. Habitat for Humanity of Greater Newburgh donated the labor for the installation of three GreenWay Series solar lighting systems from Sol. 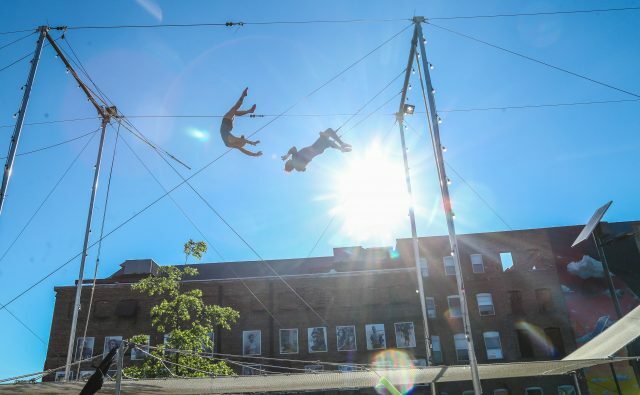 Acrobats take to the sky in Safe Harbors Green. One Nature worked with Sol throughout the process, but Silverstone says that she also had a positive experience speaking with Sol’s customer service team after the lighting installation. “I needed backup documentation for a grant, and the staff was incredibly helpful and responsive to our needs,” she says.